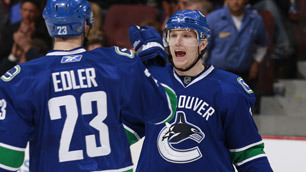 The Vancouver Canucks could boast as many as eight Olympians competing in men’s hockey. To celebrate this, Canucks.com will feature a different Olympic hopeful each Friday leading up to the games, beginning with Christian Ehrhoff. Roberto Luongo knows a thing or two about stepping up under pressure. Take Vancouver’s 3-0 win over Philadelphia, for example. Captain Luongo made 38 saves for his 49th career shutout and this clutch performance came with Steve Yzerman, executive director of Team Canada’s men’s hockey team for the 2010 Olympics, perched above the ice. Christian Ehrhoff can relate to this unofficial Olympic audition. When Vancouver battled Edmonton at GM Place on November 28, Team Germany head coach Uwe Krupp took in the game from the press box. Ehrhoff responded with his fourth multi-point game of the season; he opened the scoring with a power play rocket from a few feet inside the Oilers blueline before attacking Edmonton again on the power play, this time setting up Mason Raymond to put this game, a 7-3 Canucks win, out of reach early. The smile on Krupp’s face was reminiscent of the Grinch, just a tad less mischievous, and for good reason. The play of Ehrhoff for Team Germany in 2010 will go a long way to determining if this feverish hockey country, one starved for an Olympic medal, can land on the podium in Vancouver. It would be an understatement to say that Germany hasn’t had much success when it comes to Olympic hockey since first competing at the Games in 1928. One bronze medal is all this country of 82 million people has to show for after 12 Olympic appearances. Germany didn’t participate in the Games between 1968 and 1988, and in the five Olympics since, the black, red and yellow have yet to finish higher than sixth place. The 27-year-old defenceman, who hails from Moers, a city on the left bank of the Rhine, one of the longest rivers in Europe, will be competing at the Olympics for the third time in his young career. Despite Team Germany finishing eighth and 10th at the last two Olympics, Ehrhoff was like a sponge as he soaked in every aspect of the most renowned sporting event in the world. 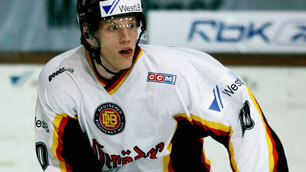 “My first time was awesome,” said Ehrhoff, who was the second youngest player in the tournament in 2002. “It started with the opening ceremonies, which was one of the best experiences in my sports life, and we did really well in that tournament as an underdog and made it to the quarter-finals, which was a huge success for us, so it was an all around great experience. Not that the Olympic allure has worn off for Ehrhoff, but he’s looking at the 2010 Games much differently because he’s no longer a wide-eyed first-timer. 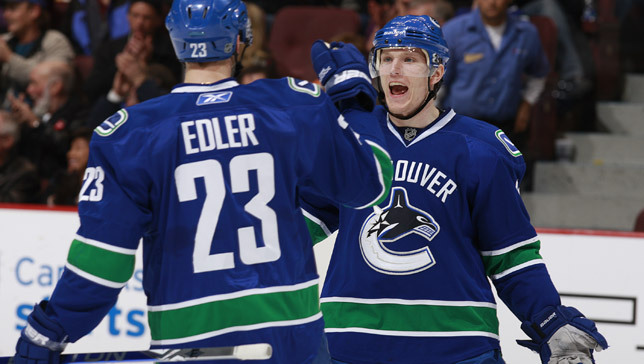 As one of only a handful of NHLers that will make the team, Ehrhoff will be looked upon to lead the defence and also chip in offensively, much like he’s done for the Canucks this season. 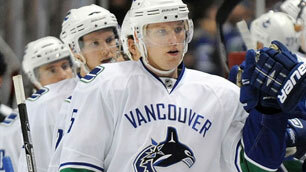 Through 28 games Ehrhoff sat sixth in team scoring with seven goals and 11 assists, while leading Vancouver at plus-12. 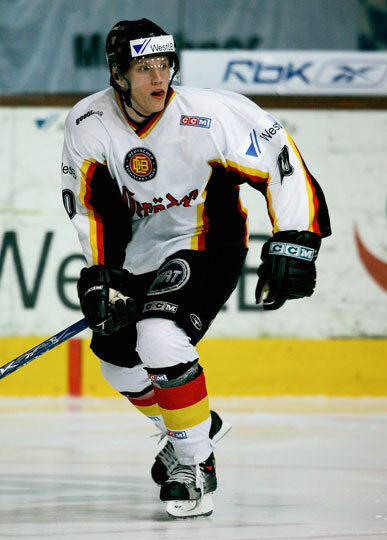 Ehrhoff is seemingly in the prime of his career, plus he’s got Olympic and NHL experience, three attributes few players on the German team boast. “They will expect me to be one of the leaders on the team and I will try to provide that,” he said. Ehrhoff expressed his displeasure in that Germany will have lowered expectations going into the Olympics next year because of how poorly the country has fared in the past, but that the underdog role is one he’s always loved to play throughout his career. 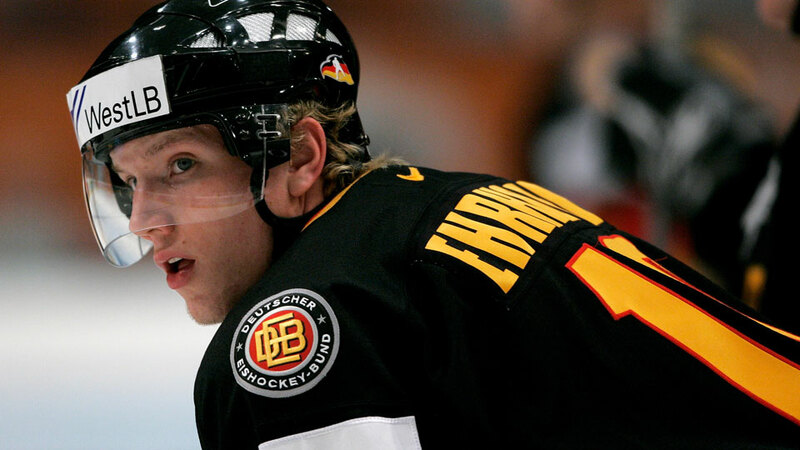 When Germany met Canada at the 2006 Games there wasn’t much hope for the Germans and that didn’t stop Ehrhoff from scoring his only Olympic goal to date. 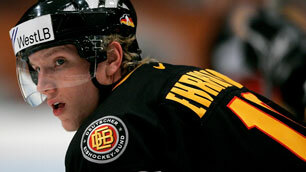 The Canadians thumped the Germans 5-1 with Ehrhoff scoring the lone goal for his country. “It was a 4-on-3 and I got the puck from behind the net, came out into the slot and I put a wrist shot on the glove side. “That was a big goal for us and it was a personal highlight for me because it was against that goalie sitting over there,” said Ehrhoff, pointing at Team Canada netminder Roberto Luongo. “I mentioned that to him once, but he kind of didn’t want to talk about it,” grinned Ehrhoff with a smile reminiscent of Krupp's. Win, lose or draw at the Olympics, Ehrhoff is hoping absorb as much knowledge as possible from coach Krupp, one of his childhood idols.